Christina and I are just wondering how on earth we can possibly be the parents of a Fourth Grader. In sporting news, the English Premier league began again this weekend, so it’s back to my usual regime of 90 minutes of solitary agony each week while the children ask why Daddy is howling at the television again. The mighty Arsenal narrowly avoided an opening day defeat against Liverpool, but they were uncharacteristically lucky and had to rely on the opposing goalkeeper throwing the ball into his own net with about two minutes to go. At least this time I was on the other side of such a goalkeeping howler – unlike earlier this summer. In book news, the rewrite continues, although it slowed a little last week as I have been struggling to burrow my way out from beneath a mountain of legal paperwork that amassed while we were away on vacation. I ran into a problem with plotting a couple of days ago and have been plundering the Old Testament in an attempt to find a way out of the hole I’ve written myself into. I think I may have solved the issue, thanks to Samson and Delilah, of all people. Good to know all those divinity lessons at school weren’t a complete waste of time. Finally, on the subject of time passing, it’s been a bad few days for jazz enthusiasts. We’ve lost two more major figures. Abbey Lincoln, a regal and powerful singer, passed away at the age of 80. Once married to the jazz drummer, Max Roach, she was both an important singer and member of the civil rights movement. She participated (in an unforgettable fashion) on Roach’s seminal We Insist! – Freedom Now, which was one of the most important musical documents of the 60s – although it’s not an album that I would suggest putting on the stereo during dinner. Here’s a link to the obit. in the Times. 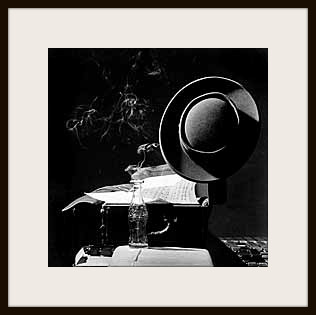 And on Friday, the great jazz photographer Herman Leonard went on up to the great jam session in the sky. His images have become such an essential part of the music’s iconography that his contribution to the art form and our perception of it is probably just as significant as any musician. Here’s one of his most famous shots, a portrait of Lester Young. RIP.